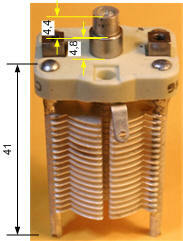 Variable capacitors of 100 pF with long shafts, like we need them for our Parasets or Tinkerboxes, are hard to get. If you can find them, they are costly. I came to several 2 x 150 pF types and figured out a way to make them to use. You are free to follow these instructions to your benefit. This job can be accomplished in about an hour. After demolishing the first one (all for the good cause!) I came up with a perfect rebuild. It is paramount to keep the right working order. I did not alter the electrical value until all other work was done, in order not to damage the platters. What is the order of tasks to complete this job successfully? Remove platters on rotor and stator to obtain the wanted value. Use a soldering iron to alternatingly heaten up the joints and force the stator to come out. One could just saw them off, but later on I took out the old rivets. The soldering has to come out, than. The rivets need to be grinded off before they can be taken out. A power tool like a Dremel, fitted with a dentist's milling bit can to the trick. Be careful not to break the ceramic. Take off the short shaft from the rotor shaft. Use some pin to softly remove the key. The key in this capacitor is made of very soft material, it could be silver. DO NOT LOOSE THE KEY. Sometimes the short shaft can be fitted tight and you have to cut it. Do so, you don't need it anymore. One can saw off the collar (short shaft). I used a tool that is called a "nut cleaver" or "nut killer". You can see the chisel cutting through the collar. You can than take the rotor out. Don't lose the key! For this job you will need a little tool. I made it from a small piece of tube, a washer and a BA6 bolt. You need to screw in the bolt and the nut will come out. It takes some effort. Sometimes the riveted back side needs some grinding first, to take away excessive material. Be sure not to apply too much force on the ceramic! The thread in the nut does not go all the way through, so you might want to put an extra washer when the nut comes out, only partially. With a pair of small self grip pliers I riveted the nuts back in again. These pliers have a moment of pressure, enough to rivet the nut. Increase pressure until a satisfying result is achieved. DO NOT overdue this! Breaking the ceramic might be the result! I took the head of a BA6 bolt and used that to press a round shape to the nut again. Apply the pressure while holding the capacitor in your hand, DO NOT put the ceramic in a vice!! DO NOT USE A HAMMER!!! Count the number of platters on the rotor. 19 make 150 pf. So approximately .. have to be taken off to obtain 100 pF. One could take off excessive material from rotor and stator. To the right: an original 100 pF. You may click the photo to enlarge. - long shaft mounted; nuts moved; platters removed; excessive material removed.